It’s pitch dark outside and our Tibetan driver is (over)cautiously driving his Chinese seven person microvan down a steep winding one lane road. Since he doesn’t read Mandarin and he has no clue about this area, Yvonne’s dad is squinting out of his passenger seat, carefully watching for the road signs. We don’t want to end up in Tibet, just yet. Finally, the asphalt turns into cobblestone announcing our arrival into the ancient market town of Shaxi, our next destination. We drag ourselves out of the car, groaning and stretching. On the bright side of things, ionly two days ago, our trip would’ve taken six hours rather than four. I still can’t believe that the four lane through the mountains and over the valleys highway from Kunming to Lijang opened two days ago, just for us. Shaxi proper is a pedestrian only village, and a short staircase fittingly separates the cars in the modern town of Sideng from a traditional Chinese world of pedestrians and donkeys. 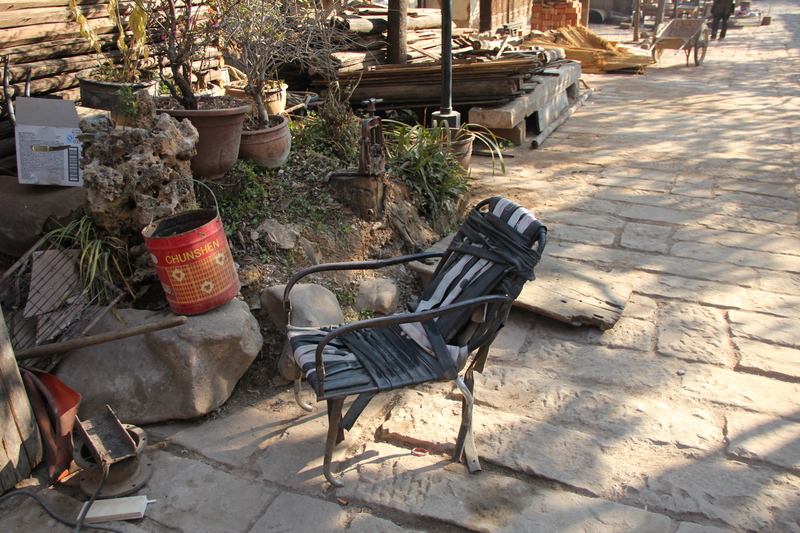 We walk down Shaxi’s main street occasionally stumbling over rough cobblestones. It is dark and quiet; a few Chinese tourists wander mindlessly around. An equally few shorter, skinnier and darker Bai locals hang out in front of their shops smoking, drinking and chilling out in front of waist tall coal burning braziers. The ever-present pollution is finally gone; the air is fresh and tasty, with occasional whiffs of incense and wood smoke. There are no street lamps and whatever light we have comes from dimly lit windows and red lanterns hanging in front of touristy establishments. The paper lanterns seem to rustle slightly even when there is no wind, welcoming us to the town. The empty dark street suddenly opens up into the world of people, excitement, music, dancing and bright colors. Bai women in red and gold embroidered white clothing are dancing to the sound of drums softened up with wooden flutes. Their men are watching and clapping support. A few tourists joined the dancers and, with mixed success, are trying to emulate the moves; their gray and black down jackets stand out among the flashing white. The women fill the frosty darkness with light and warmth. We stand entranced for a few minutes but, alas, the performance is over and the people start to leave. Disappointed but happy we go to the hotel; we randomly reserved on the internet half a day ago. The hotel shocks us. The next morning, Yvonne grunts in frustration taking one photograph after another. The camera refuses to do the justice to the impression of the ultimate perfection that the hotel delivers. It is so incredibly tasteful. The cohesiveness of the whole building is in perfect harmony with the richness of all and every details; the only thing that looks ugly is me. The place felt spacious and yet warm and inviting. Ah, I give up, I can’t really describe architecture. I’ll just try mentioning a few small things. A seven foot table in the living room was carved out of a whole piece of wood and lacquered lightly to bring out every line flowing across it. Every lantern is handmade and painted in classic Chinese ink style with nature scenery. Calligraphy adorns the walls together with classic paintings of birds and flowing water. Any of these art works would feel in place in a major art museum. Exquisite woodwork is everywhere, dark and aged with time. Rough and simple objects counter balance the artsy stuff. Our room has the strangest lock I’ve ever seen; it is a seven foot roughly hewn pole that locks the door between the ceiling and the floor. A dozen roof tiles painted and glazed with nature scenes hang on our room wall. The place is full of beauty made to be enjoyed, not to impress people. As an ultimate praise to the hotel, Yvonne is so much in love with the place that she even refuses to acknowledge a stink coming out of our room’s squat Chinese toilet. As we happily bubble with complements and praise in the morning, a son of the owner working at the desk, tells us that the house has belonged to their family for five generations. We feel like in a museum of traditional Bai architecture and art. And then, as we are still lavishing our praise, the guy innocently tells us the actual story of the house. It comes as an ultimate anticlimax. 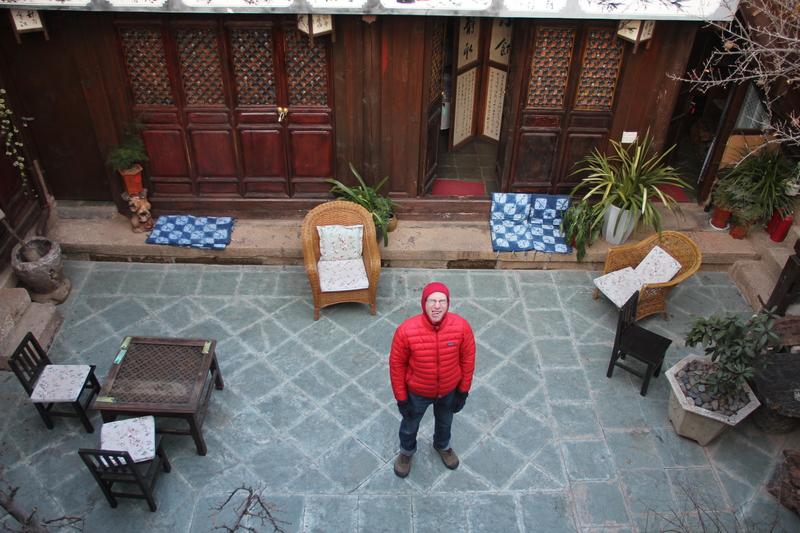 Apparently, the whole house was completely remodeled and rebuilt in four and a half months by his twenty five year old brother who just graduated from Chengdu art school. The boy did the landscaping, architecture, and art; he also supervised over the construction. The front lobby that we gaped at used to be a pigsty just four years ago. A pigsty! I am considering writing a long essay on authenticity. Bundled in all our clothing and slightly shuddering as the frosty fingers of morning air squeeze under our down jacket hoods and up our sleeves, we step outside. It’s 9am, the time to get going. The locals are smarter; they are still stretching under their heavy warm blankets waiting another hour or two till the sun finally warms up the place. The geography and climate still confuse my little brain. There is twelve hours of daylight in January; we must be relatively close to the equator, i.e. warmth. It’s most certainly not warm; at least not by my delicate Russian standards. We walk to the central square, where the night before the native women danced so enthusiastically and cheerfully. This building used to be a theater. Following the tradition, every villager had to act there at least once in his or her life to be considered fully Bai. Now, the left wing is a cafe run by a fat white expat and her Chinese husband. They sell Western coffees at $5 a glass; a two pound fresh steamed fish costs as much in a restaurant nearby. That’s the price a caffeine addict must pay. Across the ex-theater, a Taoist temple used to welcome weary and scared travelers. The friendly smiling deities would hopefully guard them from the numerous hardships of the Ancient Tea and Horse road. 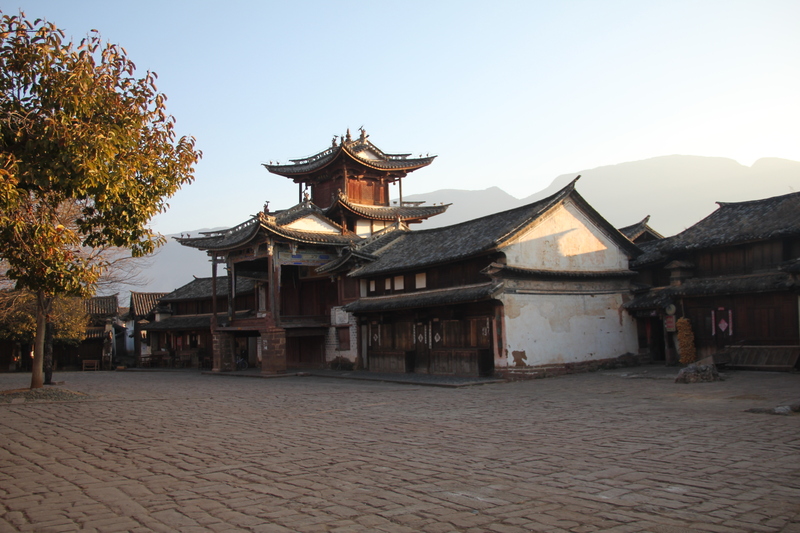 The town of Shaxi was one of key points on the long and arduous route from Tibet to Southern China. Horses and other livestock from the high mountains were traded for the lowland fares, particularly tea. Hence the road name. As a trade route, it used to be just as famous and important as the Silk Road to the north. 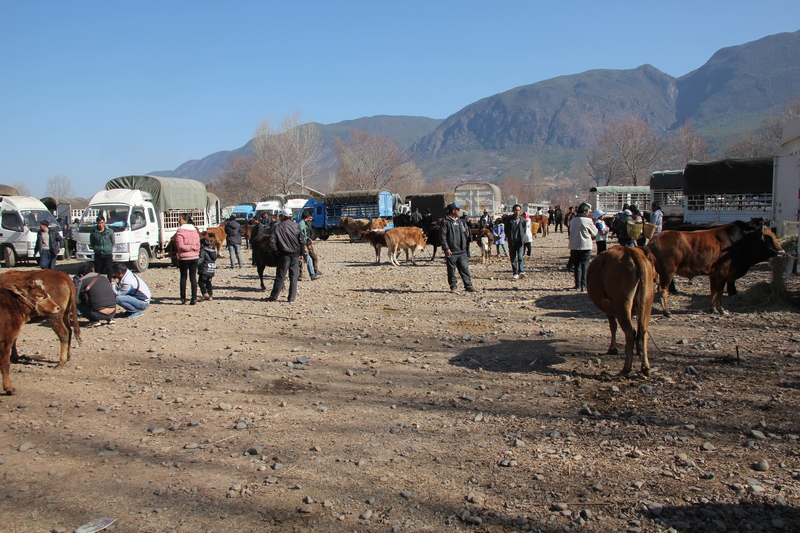 Even now, Shaxi still has a horse and cattle fair every Friday, at a pasture across the river. 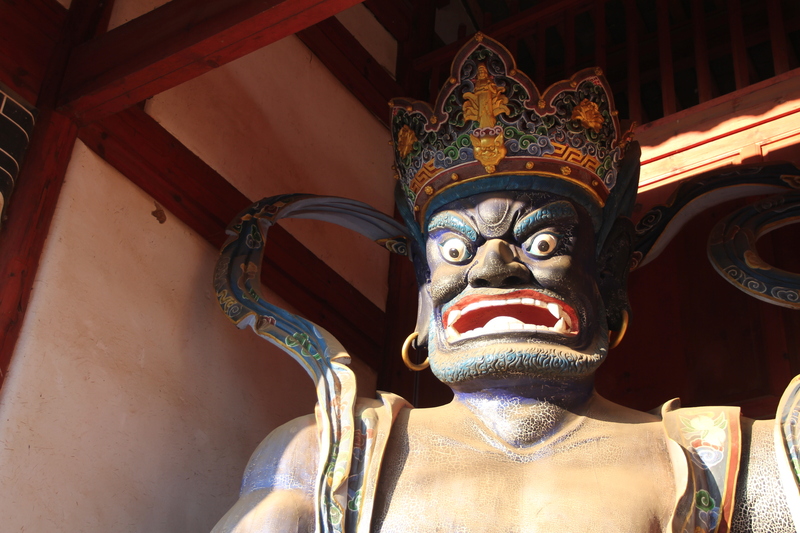 Inside the temple, we read a detailed story of Shaxi’s transformation told in UNESCO bureaucratese English. By the end of twentieth century, Shaxi was a rundown backwater town in a desperately poor area. The buildings were falling apart, the roads, sewage system and utilities hadn’t change much since the pre-modern era. The pictures look quite scary indeed; they remind me European WWII era photography. Around year 2000, the Chinese government together with a large UNESCO team re-constructed the town and trained the natives in modern sanitation, sewage and fuel usage. From the government, the locals received funding and strict building regulations. In spite of their poverty and desperation, some natives evidently kept their old skills of construction and woodworking. 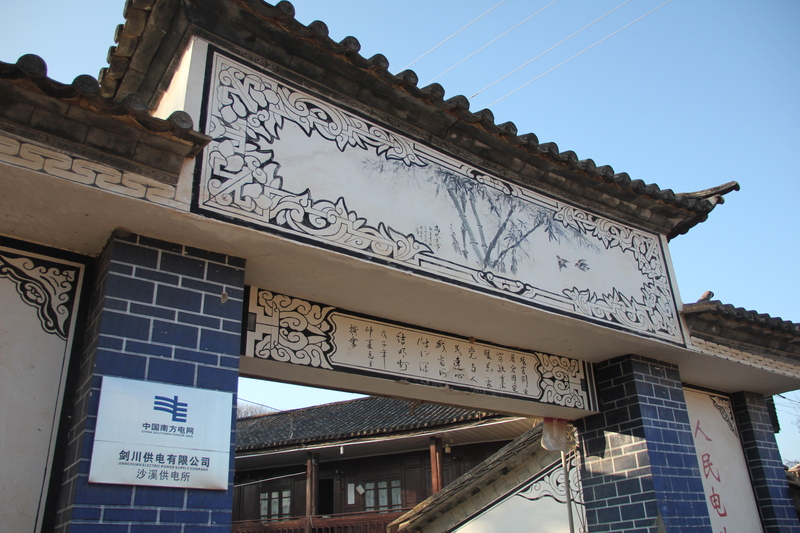 Once they got funding and motivation, they restored the buildings to the original beauty and the town of Shaxi rose out of the ashes. Guidebooks and internet brought small but steady stream of Western tourists and more money flowed into the area. Surprisingly, the teeming multitudes of the Chinese tourists still haven’t learned about the place. Shaxi residents haven’t seen yet the long rows of tour buses rolling in, and the screeching megaphones of the tour guides don’t wake them from their morning slumber. We wander around town, checking out cafes and restaurants, sneaking into hotels. It’s off season; the hotels are empty and desperate for customers. The friendly staff takes us around and shows the old restored buildings. Most of them used to be family residencies. 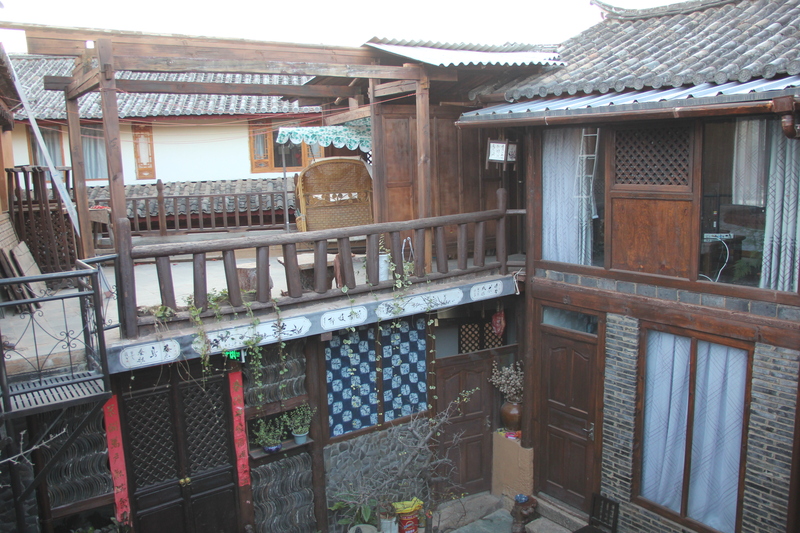 Chinese courtyard building system makes it particularly easy to turn a private house into a hotel; all the rooms are separate and they face the courtyard. The owner only needs to add restrooms. Every hotel feels inviting and warm, well in spite of temperature still hovering below forty in the shade. All of them tastefully combine spatial layout, landscaping, woodwork, tiles and ink painting. We take a vote; our hotel wins. 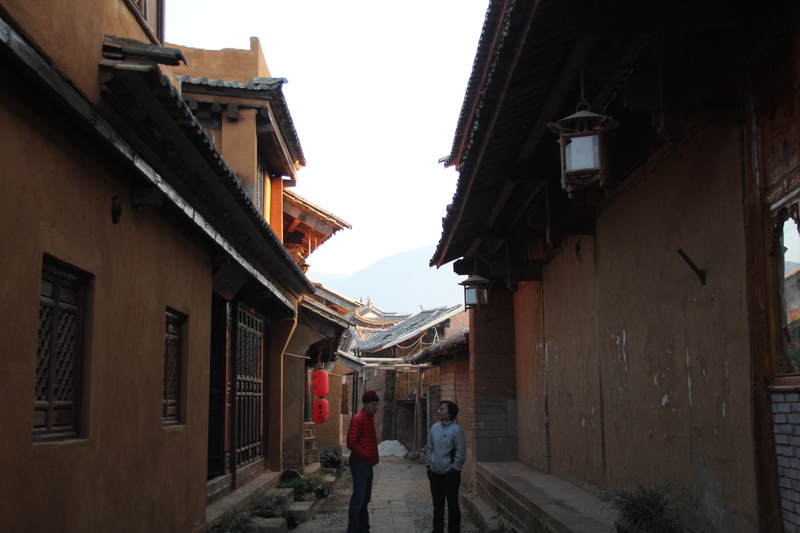 Both in Dali and Shaxi, the streets are old and narrow but much straighter than their counterparts in European cities. A day before, I find out the reason for that in one of my Chinese architecture books. Just twenty five hundred years ago, the Zhou dynasty came out with an urban development code defining cardinal grid system of straight rectangular streets going N-S and E-W. Since then, all Chinese cities followed the code. Compared to Dali, Shaxi feels smaller and it gives off more lived-in feeling; even though, it lives primarily off and for tourists. We liked Dali, our previous destination, quite a bit. But, it was not a real town. To a great extent, it was a fake tourist reconstruction. It was a good fake, tasteful and historically accurate. But it was still a fake – it was built to make tourists happy. 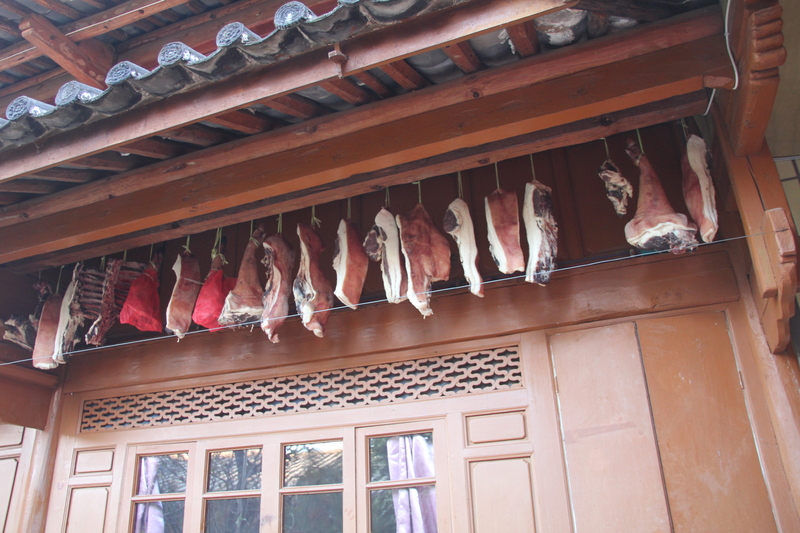 There were no pork pieces curing in the wind under a roof. There were no repair shops with chairs made out of old bicycle tires. Dali tasted more like plastic, following the plastic fake souvenirs filling its tourist shops. Shaxi feels different. The same families have been living there for generations. Year after year, they build next to and on top of the previous buildings. White blocks follow red brick, mud with straw peer from under white plaster, the Chinese tiled roofs sag a bit in the middle and disappear multi-layered into the sky. Vertical lines of characters brace every doorway, ready to share their ancient wisdom with those lucky ones who mastered the art of reading Chinese. The signs are painted, engraved and burnt on panels in styles varying from formal to flowery to relaxed. Yvonne trails off, muttering something under her breath. We walk a bit further and stop in front of an entrance to the Chinese South Electric Grid Authority. I am at a loss of words; Yvonne pets me on the head. 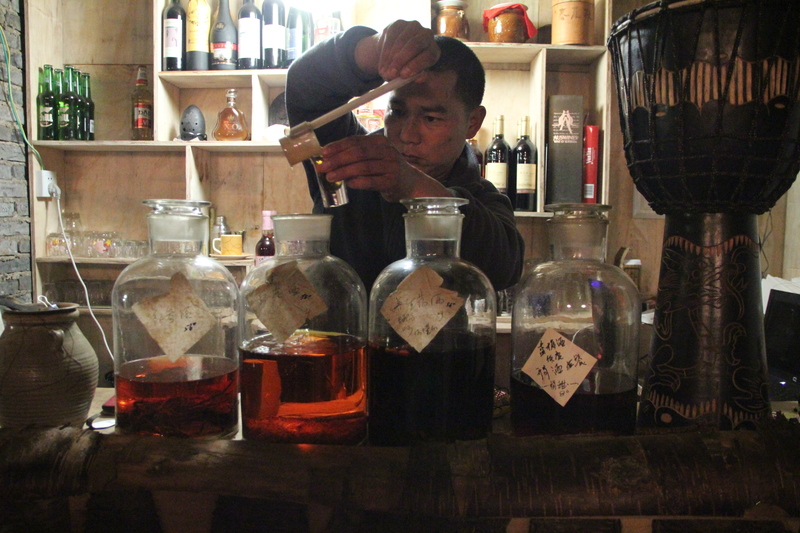 In the evening, we roam through half dark Shaxi streets looking for a place to have a drink. 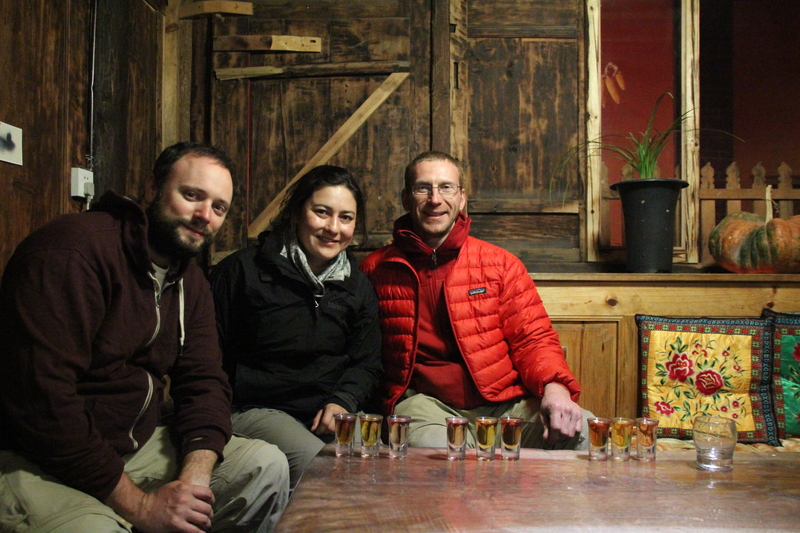 We have no interest in consuming boring and expensive imported Western booze. Through a restaurant’s open door, I see four five gallon bottles full of mysterious liquids. We walk in and inquire the barman on the nature of the drinks. Unfortunately, Yvonne’s Mandarin is not fully up to task. “He says that this is some alcohol with some mushrooms, this one has berries and this one I don’t know what he means,” Yvonne reports to us. Naturally we sit down for a tasting. For the crushing total of ten dollars, the barman brings three shot glasses with different liquors to each of us except for Yvonne and Embryona. With a great anticipation, we start tasting. Yvonne looks at us with envy. Soon, her envy turns to glee. Alas, the stuff tastes worse than Kentucky moonshine. It’s a one hundred ten proof grain alcohol that tastes like a farmer teenager son’s first distillation attempt. However, we like the feel of the place, a young Bai guy plays a skinny tall drum in the corner skillfully and fried pork spare ribs with steamed local mushrooms do a good job of masking the liquor aftertaste. “Tomorrow is Friday – it’s a market day,” declares Yvonne in the morning and I follow her to the market. By far, the animals are the most interesting part of the market. They were so recently alive, but now they are thoroughly dead, for our culinary enjoyment. 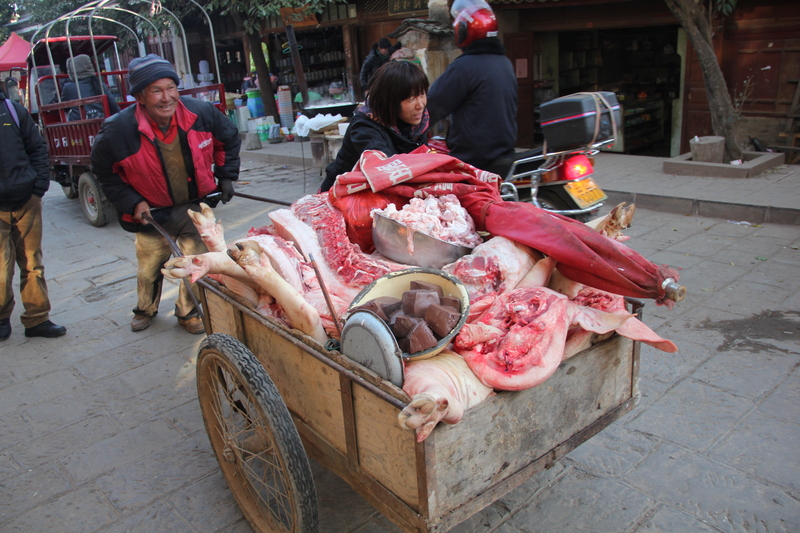 Yvonne happily squeals when she sees a cart with a dead pig, whips out her camera and starts taking pictures. The cart is our guide and we follow it to the market. At the market, Yvonne squeals again, my sweet little piglet, and makes one shot after another. There are pigs everywhere, big and small. But we see no cows and only one sad looking water buffalo. Pregnant women and puking go well together. Yvonne is in her fifth month, and she throws up so regularly that we started taking it for granted. Any strong smell, especially of sewage, garbage and cooked meat, can trigger her. At first, she freaked out, gagged, took time to recover and hated life. I kept getting nervous, asking her how she felt and trying to provide her some moral support. Now, my sweet round Pukey just turns away, throws up nonchalantly, wipes her mouth with toilet paper and stretches her hand towards me. I pass her a water bottle; she drinks and we keep walking. Ok, enough about vomit, let’s get back to food. I am looking at all this free range humanly raised and just killed meat and I crave desperately for a barbeque stand. The sad black water buffalo could provide me with the best filet mignon steaks in the world! The pigs died to give their pork chops to me. All I need is a small grill with some wood coals, or just a frying pan and a stove… One thing I don’t need is a Chinese cook. While, the Southern Chinese do fish the ultimate justice, they thoroughly misunderstand the nature of meat. They cut it in tiny pieces and throw it on a wok, essentially steaming it. It tastes so boring, I can’t even describe it. 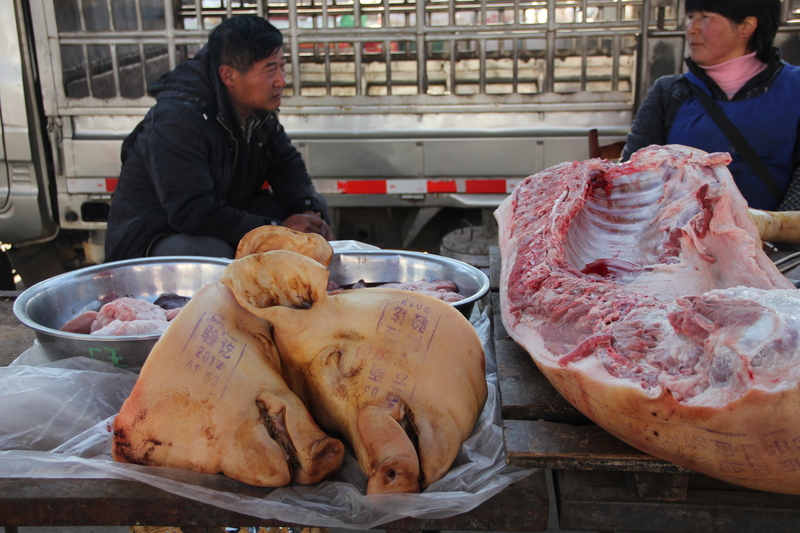 The Northern Chinese are a different story; like all cattle raising nomads, Mongols, Manchurians and Uyghurs know what to do with the meat and their influence spread from the North. However, we are currently at least five hundred miles to the south of that smoking Muslim grill with lamb chops on top. A cunning plan is slowly forming in my head; I need to sneak into a Chinese restaurant kitchen and just cook the pork chops myself. Don’t trust no nobody; they are out there to get ya. However, it’s not gonna happen today. 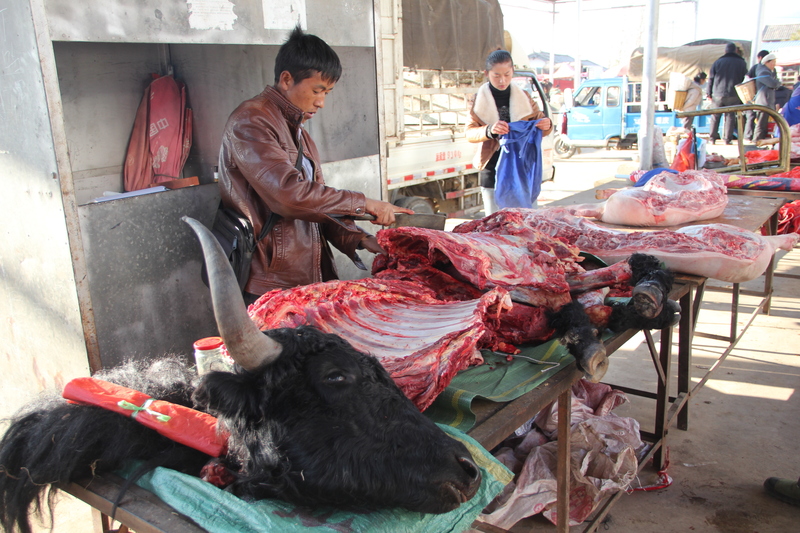 In the afternoon, we drop by to see the cattle market. I wonder if it hadn’t changed that much over the last few hundred years. Well, I may be wrong about the trucks; they probably were not here in the fifteenth century. But it must have been the same large dusty field, a few hundred scrawny cows half the size of a Holstein with scrawny half empty udders and their calves demanding attention in thin annoying voices. Short hairy horses looking like oversized scrawny ponies are tethered nearby. 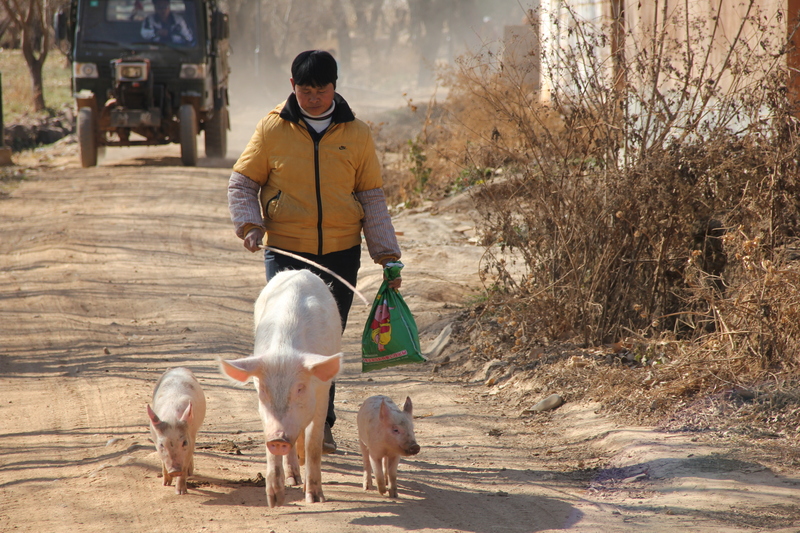 And occasional pigs wander around pretending that they follow the directions from a guy with a stick. Yvonne is all over the piglets; I just get confused, what’s the big deal? Another day of our unhurried travel through China is coming to an end. The glowing red hot sphere of the evening sun just rolled down the horizon taking all the warmth away with it. Another homicidal Chinese microvan, the car with the second highest lethal accident rate in the world is waiting for us. The driver is smiling; he probably doesn’t know the statistics. Or maybe he would rather die driving than live growing rice; I can to that. Good bye Shaxi, hello Lijang.